As Chief Development Officer, Mr Clarke will be responsible for overseeing the development of Bandanna&apos;s coal projects including the Springsure Creek project, due to commence coal export through the Wiggins Island Coal Export Terminal by mid-2014. Bandanna Energy Limited (ASX:BND), through its wholly owned subsidiary Springsure Creek Coal Pty Ltd, is pleased to announce a 50% increase in the Marketable Reserve at its Springsure Creek Project in the southern Bowen Basin south of Emerald, Queensland. Bandanna Energy Limited (ASX:BND) is pleased to announce that it has signed two Cultural Heritage Management Plans, one in relation to the Springsure Creek Coal Project and the other in relation to the Arcturus Project in the Bowen Basin, with the indigenous Karingbal people. Bandanna Energy Limited (ASX:BND) has announced the appointment of independent, non-executive director John Pegler as Chairman of the Board of Directors. John Pegler commenced as a director of Bandanna Energy on 1 January 2012. Mr Pegler is a mining engineer by training, with 39 years&apos; experience in open-cut and underground resource development, coal mining and processing operations, international and domestic coal marketing, project management and international procurement. Bandanna Energy Limited (ASX:BND) is pleased to provide a Presentation to Mines and Money Conference Hong Kong. The Directors of Bandanna Energy Limited (ASX:BND) present their report on the Consolidated Group consisting of the Company and its controlled entities for the half year ended 31 December 2011. 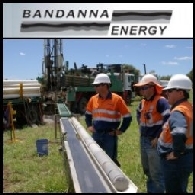 Bandanna Energy Limited (ASX:BND) Springsure Creek train loadout infrastructure agreement. Bandanna has entered into a binding agreement with Acacia Coal Limited (ASX:AJC) in relation to the sharing of train loadout infrastructure, in return for Acacia&apos;s consents to Bandanna&apos;s applications for transportation and infrastructure mining leases over portions of Acacia&apos;s EPC 1230. Bandanna Energy Limited (ASX:BND) is pleased to announce that highly regarded mining executive Michael Gray has officially joined the company as its new Managing Director. Bandanna Energy Limited (ASX:BND) is pleased to announce that it is now finalising the Terms of Reference (TORs) for its Environmental Impact Statement (EIS) for Dingo West Project following closure of the advertising period for the draft TORs. Bandanna Energy Limited (ASX:BND) is pleased to announce, it has signed two Cultural Heritage Management Plans, one for the Springsure Creek Coal Project and the other for the Arcturus Project in the Bowen Basin, with the indigenous Kairi People. The Plans will provide a framework for Bandanna Energy and the Kairi People to work together to identify and manage cultural heritage whilst facilitating the development of the projects. Bandanna Energy Limited (ASX:BND), through its wholly owned subsidiary Springsure Creek Coal Pty Ltd, is pleased to announce it has awarded a contract to Asciano (ASX:AIO) for the haulage of coal for up to 15 years. 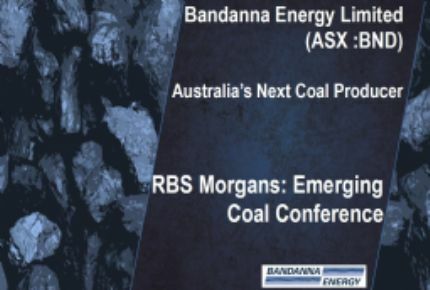 Bandanna Energy Limited (ASX:BND) provides the opportunity to listen to an audio broadcast with Dr Ray Shaw, Managing Director in a presentation titled "Bandanna releases a new coal reserve estimate". 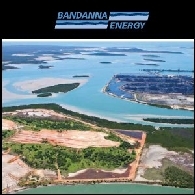 Bandanna Energy Limited (ASX:BND) is pleased to provide a quarterly report for the period ended 31 December 2011. Bandanna Energy Limited (ASX:BND) is pleased to announce that AMCI, the manager for the South Galilee Coal Project (SGCP) Joint Venture and 50% participant, has provided a JORC compliant Coal Reserves Estimate for open cut mineable reserves prepared by Echelon Mining Services. The Reserve Estimate is based on the Coal Resource Statement prepared in February 2011 and data provided in the Pre-Feasibility Study completed in April 2011. 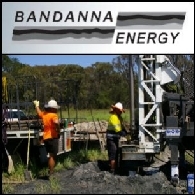 Bandanna Energy Limited (ASX:BND) provides an update on its activities as at 4th January 2012. Bandanna Energy Limited (ASX:BND) provides the following update on its activities as at 23rd December 2011. Bandanna Energy Limited (ASX:BND) is pleased to announce it has reached in-principal agreement with the Indigenous Kairi people on the terms for Cultural Heritage Management Plans at the Springsure Creek Coal Project and the Arcturus Project in the Bowen Basin. Bandanna Energy Limited (ASX:BND), through its wholly owned subsidiary Springsure Creek Coal Pty Ltd, is pleased to announce that Xenith Consulting has certified resources in the Springton domain totalling 255.9 million tonnes. This Resource comprises Inferred Resources of 109.7 million tonnes and Indicated Resources of 146.1 million tonnes. The new Resource Statement follows the completion of boreholes of the targeted Aries 2 seam since July 2011. Bandanna Energy Limited (ASX:BND) announces the appointment of highly experienced mining executive Michael Gray to the position of Chief Executive Officer. Mr.Gray&apos;s appointment will become effective in the first quarter of 2012 at which time he will join the board of the company as Managing Director. Bandanna Energy Limited (ASX:BND) is pleased to announce that the South Galilee Coal Project Joint Venture, in which it is a 50% participant together with AMCI (50% and manager), has received the consent of the Wangan and Jagalingou People (W & J People) for all approvals needed to develop the Project and infrastructure corridor. Bandanna Energy Limited (ASX:BND) provides update on its activities regarding Wiggins Island Port and Bowen Basin developments. Bandanna Energy Limited (ASX:BND) wishes to advise that the South Galilee Coal Project Joint Venture, of which it is a 50% participant together with AMCI (50% and manager), that it has been unsuccessful in the award of Preferred Respondent status for the T4-9 expansion of Abbot Point as announced by the Northern Queensland Bulk Ports (NQBP) and Queensland State Government today. As part of Bandanna Energy Limited&apos;s (ASX:BND) commitment to ensuring future mining impacts on agricultural lands within the Springsure Creek, Arcturus and Arcadia project locations are minimised, and that these projects capture the spirit of proposed Strategic Cropping Lands legislation that is expected to address issues relating to the co-existence of mining and agricultural activities, we are pleased to make some announcement. Bandanna Energy Limited (ASX:BND) note the Dow Jones news wire released on Friday 7th October 2011 claiming "a person familiar with the project" had indicated that the Strategic Review process had been terminated. This statement is baseless and we encourage stakeholders to be guided by our announcements released on the ASX and posted onto our web site. Bandanna Energy Limited (ASX:BND) is pleased to announce that construction of Wiggins Island Coal Export Terminal (WICET) - Stage 1, is to commence following the successful completion of its financing package and tenure arrangements. The new 27 Mtpa capacity terminal will be built adjacent to the existing RG Tanner terminal at Gladstone. On 17 August 2011 Bandanna Energy Limited ("Bandanna") (ASX:BND) announced its 5 for 16 accelerated non-renounceable entitlement offer ("Entitlement Offer") to raise up to approximately A$133 million. The institutional component of the offer underwritten by UBS, attracted strong demand from Bandanna&apos;s existing institutional shareholders and new institutional shareholders and was oversubscribed, raising gross proceeds of approximately A$100 million. Bandanna Energy Limited (ASX:BND) is pleased to announce that it has reached a commercial agreement for a rail solution for its Golden Triangle projects. The Wiggins Island Rail Project (WIRP) Agreement was reached by Bandanna Energy and other Stage 1 WICET shippers with QR Network Pty Ltd, a wholly owned subsidiary of QR National (ASX:QRN). Bandanna Energy Limited (ASX:BND) wishes to advise that the retail component of the Entitlement Offer ("Retail Offer") will open on Thursday, 25 August 2011 and will close at 5.00pm (AEST) on Friday, 9 September 2011. The Retail Offer is for the issue of up to approximately 33 million shares at A$ 1.00 each, on the basis of 5 new ordinary shares for every 16 existing ordinary shares held at 7.00 pm (AEST) on Monday 22 August, 2011. The Retail Offer is non-renounceable and is not underwritten. Bandanna Energy Limited (ASX:BND) today announced the successful completion of the institutional component of its 5 for 16 accelerated non-renounceable entitlement offer of new Bandanna ordinary shares at an offer price of A$1.00 per New Share Completion of the Institutional Offer represents the first stage of Bandanna&apos;s capital raising of up to approximately A$133 million, announced on 17 August 2011. The Institutional Offer has raised gross proceeds of approximately A$100 million. Bandanna Energy Limited (ASX:BND) today announces an equity raising by way of an accelerated non-renounceable entitlement offer ("Entitlement Offer") to raise up to approximately A$133 million to assist with developing key projects including securing Stage 1 capacity at Wiggins Island Coal Export Terminal ("WICET") and associated rail allocation. Bandanna Energy Limited (ASX:BND) is aware of further recent media speculation concerning the process which Bandanna Energy Limited previously announced to address the outcomes of the strategic review conducted earlier in the year. Bandanna Energy Limited (ASX:BND), through its wholly owned subsidiary Springsure Creek Coal Pty Ltd, is pleased to announce a 109% increase in Marketable Reserve at its Springsure Creek Project in the southern Bowen Basin south of Emerald, Qld. Bandanna Energy Limited (ASX:BND), through its wholly owned subsidiary Springsure Creek Coal Pty Ltd, is pleased to announce an increase to 374.5 million tonnes in its JORC compliant Resources at EPC 891 (Springsure Creek). This Resource comprises Inferred Resources of 245.0 million tonnes and Indicated Resources of 129.5 million tonnes. The Indicated Resource represents an increase of 79.3% compared to the last Resource Statement issued in October 2010. The new Resource Statement follows the completion of 3 chip and 14 cored boreholes of the targeted Aries 2 seam. Bandanna Energy Limited (ASX:BND), through its wholly owned subsidiary Dingo West Coal Pty Ltd is pleased to announce that it has formally applied for a Mining Lease on EPC 881, known as Dingo West. Bandanna Energy Limited (ASX:BND) is aware that there has been recent media speculation concerning the Bandanna Energy Limited transaction process. As previously announced, Bandanna has invited shortlisted parties to progress through a second stage of the transaction process. This stage involved management presentations and detailed due diligence. Bandanna Energy Limited (ASX:BND) is pleased to announce that it has been notified of the Federal Government Department of Sustainability, Environment, Water, Population and Communities decision under the Commonwealth Environment Protection and Biodiversity Conservation Act 1999 in respect to the Dingo West Coal Mine Project. Bandanna Energy Limited (ASX:BND) notes the announcement by the Prime Minister of a proposed carbon tax on emissions of greenhouse gases. Bandanna has undertaken a preliminary assessment of the likely effect of the carbon tax on its projects. At this stage the analysis has only considered the tax effect on fugitive emissions of methane from Bandanna&apos;s projects, as this is expected to be the largest single source of Bandanna&apos;s greenhouse gas emissions. Bandanna Energy Limited (ASX:BND) is pleased to announce that it has acquired additional priority capacity rights which will underpin its current application for an allocation in Wiggins Island Coal Export Terminal Stage 2. Bandanna Energy Limited (ASX:BND) provides an update on its South Galilee Project: AMCI exercises it right to earn 50% interest; South Galilee JV applies for Mining Lease. Bandanna Energy Limited (ASX:BND) welcomes the recent announcement by the Honourable Kate Jones, Minister for Environment and Resource Management, concerning the eligibility milestones for Strategic Cropping Land Transitional Arrangements. Bandanna Energy Limited (ASX:BND) is pleased to advise that it has received its Final Terms of Reference for the Arcturus and Springsure Creek Coal Mine Project&apos;s environmental impact statements. These were finalised in accordance with section 46 of the Environmental Protection Act 1994 (EP Act). As previously announced, Bandanna Energy Limited (ASX:BND) is undertaking a transaction process to address the outcomes of the strategic review conducted earlier in the year. As previously announced, Bandanna Energy Limited (ASX:BND) is undertaking a transaction process to address the outcomes of the strategic review conducted earlier in the year. Non-binding indicative bids were due for submission by close of business on 4th May 2011. Australian coal explorer Bandanna Energy Limited (ASX:BND) is pleased to announce it has received Final Environmental Impact Statement Guidelines from the Commonwealth Government for its Arcturus and Springsure Creek projects located in Queensland&apos;s Bowen Basin. Bandanna Energy Limited (ASX:BND) is pleased to advise that it has received the prefeasibility study for the South Galilee Coal Project from the project manager, AMCI. The PFS was compiled by mining and construction consultant Aurecon Hatch with contributions from over 20 additional specialist consultants with expertise in specific technical, legal and infrastructure fields. Bandanna Energy Limited (ASX:BND) has completed a Strategic Review Process to complete the development of its key assets. Bandanna Energy Limited (ASX:BND) has enhanced its position as an emerging producer in the Australian thermal coal sector, announcing today the receipt of Feasibility Studies by Brisbane based mining and infrastructure consultants Larpro Projects which has assessed the viability of developing Bandanna&apos;s Springsure Creek, Arcturus and Dingo West coal projects. Bandanna Energy Limited (ASX:BND) is pleased to announce that it has been notified of the Federal Government&apos;s decisions under the Environment Protection and Biodiversity Conservation Act (Cth) 1999. 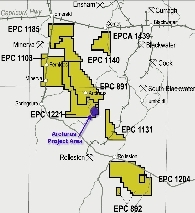 (EPBC Act) in respect of the Springsure Creek and Arcturus projects. Bandanna Energy Limited (ASX:BND) has received expected product coal quality specifications for the South Galilee Project. Bandanna Energy Limited (ASX:BND), through its wholly owned subsidiary Springsure Creek Coal Pty Ltd, is pleased to announce that it has received the draft Terms of Reference (TOR) from the Queensland Department of Environment and Resource Management for both the Arcturus and Springsure Creek Coal projects in the southern Bowen Basin. Bandanna Energy Limited (ASX:BND) provides update on strategic review to consider future funding requirements to develop its three key Bowen Basin projects. Bandanna Energy Limited (ASX:BND) release an independent evaluation of the resources for the South Galilee Project (SGP) Joint Venture following completion of Prefeasibility drilling during the 2010 field season. Following the successful completion of its A$76 million capital raising in December 2010, Bandanna Energy Limited (ASX:BND) has progressed the strategic review of its operations announced to the ASX on 15/12/2010. 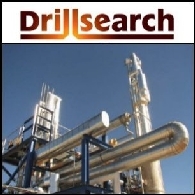 Drillsearch Energy Limited (ASX:DLS) (PINK:DRLLF) is pleased to announce that it has acquired all of the remaining Queensland petroleum interests held by Bandanna Energy Ltd (ASX:BND) being interests in ATP539P, ATP549P West and PL18. The total consideration paid to acquire all of Bandanna&apos;s remaining interest is A$150,000. Bandanna Energy Limited (ASX:BND) is pleased to announce that it has taken a further important step toward production announcing the submission of Environmental Referrals for the Arcturus and Springsure Creek projects to the Federal Government. The referrals to the Federal Department of Sustainability, Environment, Water, Population and Communities seek to have both projects considered under the Federal Environment Protection and Biodiversity Conservation Act 1999. Bandanna Energy Limited (ASX:BND) is pleased to announce that it has successfully completed the institutional placement announced on 14 December 2010. The Placement, raising approximately A$76 million, was priced at A$1.42 per share, an 11.6% discount to the 5 day VWAP ending 13 December 2010 and will result in the issue of 53,533,323 ordinary shares to participating investors. Bandanna Energy Limited (ASX:BND), in its quest to move from explorer to producer, has taken a further important step toward production announcing the start of the statutory environmental approval process for its Dingo West Project through the submission of its Environmental Referral to Government. Bandanna Energy Limited (ASX:BND) has taken an important step towards the future development of its "Golden Triangle" opportunities in Queensland&apos;s Bowen Basin, announcing the start of the statutory environmental approval process for its Arcturus and Springsure Creek projects through the submission of Initial Advice Statements to Government. Bandanna Energy Limited (ASX:BND), through its wholly owned subsidiary Springsure Creek Coal Pty Ltd is pleased to announce its maiden Marketable Reserve at its Springsure Creek Project in the southern Bowen Basin south of Emerald, Qld. Bandanna Energy Limited (ASX:BND), through its wholly owned subsidiary Springsure Creek Coal Pty Ltd, is pleased to announce an increase to 324.2 million tonnes in its JORC compliant Resources at EPC 891 (Springsure Creek). This Resource comprises Inferred Resources of 252 million tonnes and Indicated Resources of 72.2 million tonnes. The Indicated Resource represents an increase of 108% compared to the last Resource Statement in March 2010. Bandanna Energy Limited (ASX:BND) through its wholly owned subsidiary Springsure Creek Coal Pty Ltd, is pleased to announce its maiden Marketable Reserve at its Arcturus Project in the southern Bowen Basin south of Emerald, Qld. 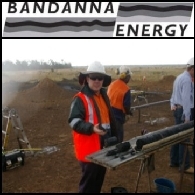 Bandanna Energy Limited (ASX:BND) is pleased to announce the appointment of Mr Peter Binnie as Manager - Infrastructure. Bandanna Energy Limited (ASX:BND), through its wholly owned subsidiary Springsure Creek Coal Pty Ltd is pleased to announce an increase in its JORC compliant resources at EPC 1221 (Arcturus) to 206.3 million tonnes. Bandanna Energy Limited (ASX:BND) is pleased to announce its inclusion in Stage 1 of the proposed Wiggins Island Coal Export Terminal development at Gladstone. This will give Bandanna access to a 4 million tonnes per annum port allocation from early 2014. 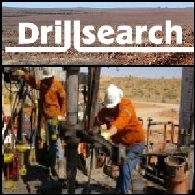 Drillsearch Energy Limited (ASX:DLS) (PINK:DRLLF) is pleased to announce that it has acquired interests in four Wet Gas Discoveries from Bandanna Energy Ltd (ASX:BND) with additional 2P oil & gas reserves and 2C Contingent Resources in its core Cooper Basin Western Flank Oil Fairway and Gas & Liquids Projects. Bandanna Energy Limited (ASX:BND) and its farmin and co-venturer, AMCI (Alpha) Pty Ltd, have welcomed the release of the Queensland Government&apos;s draft Terms of Reference (ToR) for their proposed A$1.5 billion South Galilee coal project west of Rockhampton. Bandanna Energy Limited (ASX:BND) has stepped up its drilling activity with the addition of a sixth drill rig. Three rigs are now currently drilling in Bandanna&apos;s Golden Triangle area and three, operated by AMCI, are drilling in the South Galilee Project area. 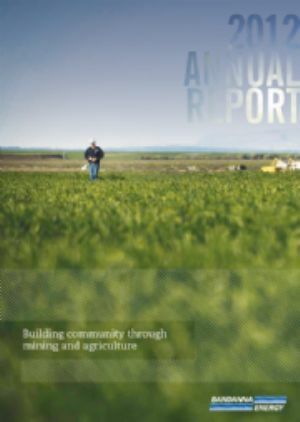 Bandanna Energy Limited (ASX:BND) is pleased to release quarterly report for the three months ended 30 June 2010. Bandanna Energy Limited (ASX:BND) and its farmin and co-venturer, AMCI (Alpha) Pty Ltd, are pleased to advise that their South Galilee Project, located near Alpha in the Galilee Basin, has been declared a Significant Project by the Queensland Government. Bandanna Energy Limited (ASX:BND) is pleased to announce a drilling program has resumed at its Joint Venture coal tenements in the Galilee Basin in Central Queensland. 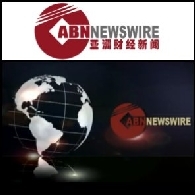 ABN Newswire stocks to watch today include: Brickworks Limited (ASX:BKW), Bandanna Energy Limited (ASX:BND) and Fufeng Group Limited (HKG:0546). Bandanna Energy Limited (ASX:BND) through their wholly owned subsidiary Springsure Creek Coal Pty Ltd is pleased to announce an increase in their JORC compliant resources at EPC 891 (Springsure Creek) to 304.7 million tonnes. Bandanna Energy Limited (ASX:BND) is pleased to announce that the Operator of the South Galilee Project Joint Venture, AMCI (Alpha) Pty Ltd, has commenced Pre Feasibility Studies (PFS) following the award of various contracts. The PFS follows successful completion of a Concept Study which identified a conceptual open cut and underground mine development of 43 years mine life, with an average annual production of between 15 and 20 Mt of thermal coal, centred on EPC 1049. Bandanna Energy Limited (ASX:BND) is pleased to announce the appointment of David Campbell as Manager - Exploration. David was, from 2006 until January 2010, Vice President - Exploration of Waratah Coal Inc which holds extensive exploration areas in the Galilee Basin, including the China First Project located immediately adjacent to Bandanna&apos;s South Galilee Project. ABN Newswire stocks to watch today include: Carpentaria Exploration Limited (ASX:CAP), Marion Energy Limited (ASX:MAE) (PINK:MAEJF), Murchison Metals Limited (ASX:MMX) (PINK:MUMTF), Bandanna Energy Limited (ASX:BND), Focus Minerals Limited (ASX:FML) and Metallica Minerals Ltd (ASX:MLM). The following activities have been conducted by, or on behalf of, Bandanna Energy Limited (ASX:BND) and its wholly-owned subsidiaries ("Bandanna") during the three months 1 October to 31 December 2009 ("Reporting Period"). ABN Newswire stocks to watch today include: Image Resources (ASX:IMA)(PINK:IMREF), Carbon Energy Limited (ASX:CNX)(PINK:CNXAF), Kingsrose Mining Limited (ASX:KRM) and Bandanna Energy Limited (ASX:BND). Bandanna Energy Limited (ASX:BND) is pleased to advise that Wiggins Island Coal Export Terminal ("WICET") has announced the go-ahead for the next phase of development of the terminal at the Port of Gladstone. This follows the execution of a Framework Deed with the Queensland Government and Gladstone Ports Corporation. Bandanna Energy Limited (ASX:BND) is pleased to announce the appointment of Mr Park Soon IL as a director of Bandanna on 19 November 2009, following the 10% share placement to SAMTAN Aures Pty Ltd, a wholly owned subsidiary of SAMTAN Co., Ltd. The following activities have been conducted by, or on behalf of, Bandanna Energy Limited (ASX:BND) and its wholly-owned subsidiaries during the three months 1 July to 30 September 2009 ("Reporting Period"). Queensland coal developer, Bandanna Energy Limited (ASX:BND) today gained a leading Korean energy group as 10 per cent shareholder and received A$22.5 million to expedite development of its 100%-owned coal assets. Bandanna Energy Limited (ASX:BND) is pleased to announce that it has received notification from SAMTAN Co. Ltd ("SAMTAN") that the Board of SAMTAN has approved the A$22.5 million subscription by SAMTAN Aures Pty Ltd for shares in Bandanna (the "Transaction"). Bandanna Energy Limited (ASX:BND) has entered into a share subscription agreement (&apos;Subscription Agreement&apos;) with the Korean based SAMTAN Aures Pty Ltd, a wholly owned subsidiary of SAMTAN Co., Ltd (&apos;SAMTAN&apos;) to issue 37,532,016 fully paid ordinary shares to SAMTAN, [equating to 10.0% of Bandanna&apos;s fully diluted shares on issue post placement] at an issue price of A$0.60 per share, raising A$22.5 million. Bandanna Energy Limited (ASX:BND) is pleased to announce that it has engaged an independent consulting group to undertake a Concept Study for the development of its Arcturus Project as a potential open cut thermal mine. EPC 1221 is 100% held by Springsure Creek Coal Pty Ltd, a wholly-owned subsidiary of Bandanna. Bandanna Energy Limited (ASX:BND) is pleased to provide the attached Report on the Exploration Target for the Northern Area of EPC 1049. This report identifies, in accordance with the JORC Code, a significant coal exploration target of 570 Mt to 960 Mt (average 830 Mt) within an area of approximately 100 km2 of EPC 1049. This target relates only to the daughter seams of the D1 and D2 seams. Bandanna Energy Limited (ASX:BND) is pleased to provide the attached Resource Statement for the Alpha Project Joint Venture&apos;s EPC 1049 located in the eastern Galilee Basin. The results relate to 150 drill holes (including 58 partially cored holes and 11 re-drills) totalling more than 17,500 m of drilling. This work has been fully funded by AMCI (Alpha) Pty Ltd (AMCI) as part of a farmin agreement by which AMCI can earn up to 50% interest in the Alpha Project area by spending up to A$25 million. Bandanna Energy Limited (ASX:BND) is pleased to announce an update to the Resources in EPC 1221 ("Arcturus Project") estimated in accordance with the JORC Code. Gordon Saul*, Principal Geologist of Resolve Geo Pty Ltd, consultants to Bandanna Energy Limited, has provided the attached Resource Statement. Bandanna Energy Limited (ASX:BND) is pleased to announce the results of its recent exploration campaign in EPC 1221 ("Arcturus Project"), comprising 21 open holes, 11 Line of Oxidation holes and 11 core holes. Bandanna Energy Limited (ASX:BND) is pleased to announce that its application EPCA 1189, through its wholly owned subsidiary Carnarvon Coal Pty Ltd, has now been approved by the Queensland Government authorities. The new permit, EPC 1189, is located in the southern Bowen Basin and is contiguous with EPC 1195 awarded to Bandanna in February 2009. Bandanna Energy Limited (ASX:BND) wishes to announce that it has reached an agreement with Custom Mining Dingo Pty Ltd ("CMD" a subsidiary of Macarthur Coal Limited; ASX Code MCC) regarding CMD&apos;s withdrawal from the Joint Venture and Farm In Agreement relating to the Dingo West Project in EPC 881. In doing so Bandanna (through its wholly owned subsidiary Dingo West Coal Pty Ltd) will now retain a 100% interest in this Project. Bandanna Energy Limited (ASX:BND) is pleased to announce that it has recently received encouraging gas content and composition information from their wholly owned Springsure Creek exploration project, EPC 891. Analysis by Geogas, the principal supplier of gas data to the Queensland coal industry, indicates low gas levels within the potential underground project area at Springsure Creek. 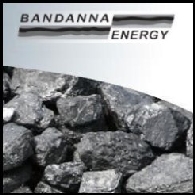 Bandanna Energy Limited (ASX:BND) is pleased to announce that its application EPCA 1195, through its wholly owned subsidiary Carnarvon Coal Pty Ltd, has now been approved by the Queensland Government authorities. The new EPC 1195 is located in the southern Bowen Basin and is contiguous with EPCA 1189, which is currently an application by Bandanna Energy. AUDIO: Bandanna Energy Limited (ASX:BND)(formerly Enterprise Energy Limited) is pleased to announce the successful completion of the transaction previously announced to the market on 7 May 2008. 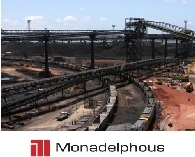 The transaction entailed acquisition of all the issued share capital of Bandanna Coal Pty Ltd, a 1 for 10 consolidation of shares, a capital raising of A$10 million and a change of company name, following shareholder approval on 15 September 2008. Bandanna Energy Limited (ASX:BND) is pleased to announce that its applications EPCA 1179 and EPCA 1180 have now been approved by the Queensland Government authorities. The new EPCs, 1179 and 1180, are located in the eastern Galilee Basin and lie contiguous with EPCs 1048 and 1049 which have been previously granted to the Company. Bandanna Energy Limited (ASX:BND) is pleased to release details of the exploration programs to be undertaken during the first quarter of 2009. Bandanna Energy Limited (ASX:BND) provides the opportunity to listen to an audio broadcast with Dr Ray Shaw, Managing Director in a presentation titled "BND - Coal Quality Results & Outlook for 2009 - Dr Ray Shaw, Managing Director". Bandanna Energy Limited (ASX:BND) is pleased to release the following coal quality results from EPC 891 - Springsure Creek, located in the Bowen Basin, Queensland. This tenement is 100% owned by Springsure Creek Coal Pty Ltd, a wholly owned subsidiary of Bandanna. Bandanna Energy Limited (ASX:BND)(formerly Enterprise Energy Limited) is pleased to announce the successful completion of the transaction previously announced to the market on 7 May 2008. 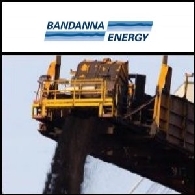 The transaction entailed acquisition of all the issued share capital of Bandanna Coal Pty Ltd, a 1 for 10 consolidation of shares, a capital raising of A$10 million and a change of company name, following shareholder approval on 15 September 2008. The first gas revenue proceeds for petroleum explorer, Enterprise Energy NL (ASX: EPE) are about to flow as a result of the Company&apos;s successful focus on the Cooper Basin.